When poetry finds you, it can’t be ignored. It slowly connects with you in secret, like a micro-thin layer of new skin. Then one day, years later, you realize it is a necessary and vibrant part of who you are. We started studying poetry during our first year of travel-school. At the time, I had no idea how to teach poetry. I didn’t really understand it myself, but knew I wanted to learn. I have thought about this concept so many times since that day. When someone doesn’t understand you, it is likely they do not want to understand. The same can be said of learning. There is something fundamentally courageous and authentic when sharing one’s imperfections – through art, language, thoughts, feelings, words. Responding with empathy is also courageous and authentic. We are all trying to figure out our place in the world and (hopefully) doing our very best to understand each other as we go. 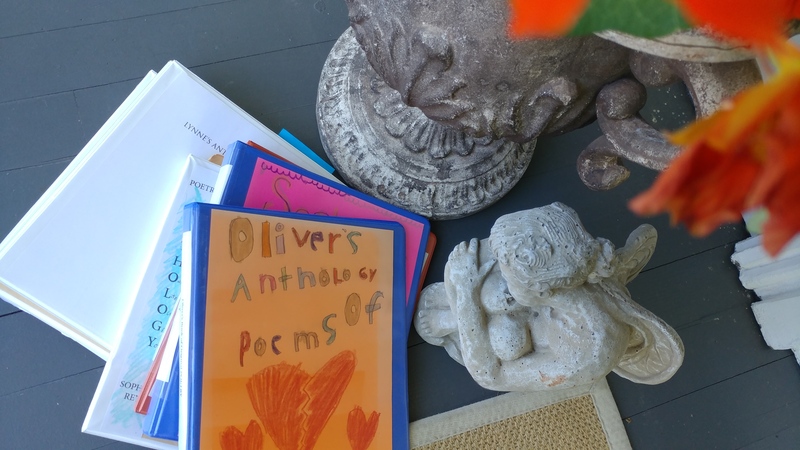 When I set about teaching poetry to the kids, I decided we were going to have to start at the very beginning and we had to want to learn, in order to succeed. I also knew I was going to have to get creative, in order to hold everyone’s interest. We endeavored to understand the language of poetry and I hoped we might appreciate it as an art form as well. I never guessed it would bring so much joy to our lives. At the time, the kids were young (8 & 10yrs) so we started out by reading an abundance of children’s poetry. Limericks were our favorite, along with every Shel Silverstein poem ever written. 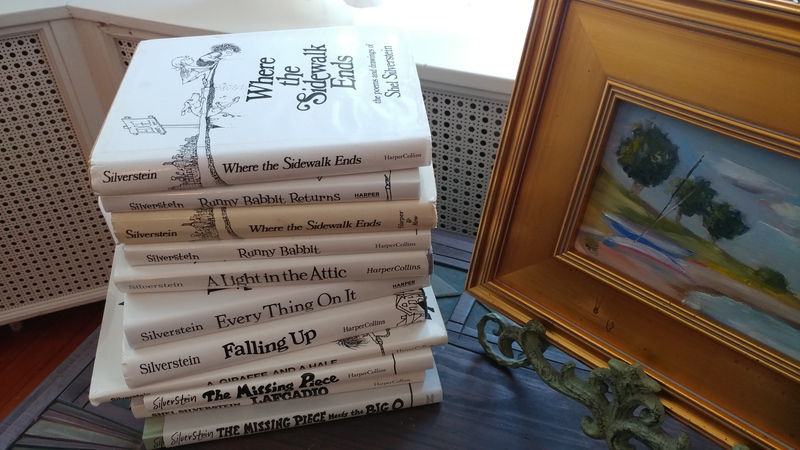 Our Silverstein collection is always out and ready to gobble. We all loved de la Mare’s “Mermaids” and Lear’s “The Jumblies” and any poems with crass potty references. I bought binders, which we decorated and titled as our personal anthologies. We devoured weekly trips to the local library and brought home stacks of poetry books. As we read, we each used a different color post-it pad to label our favorites, then photo-copied them for our anthologies. This was such a fun process. 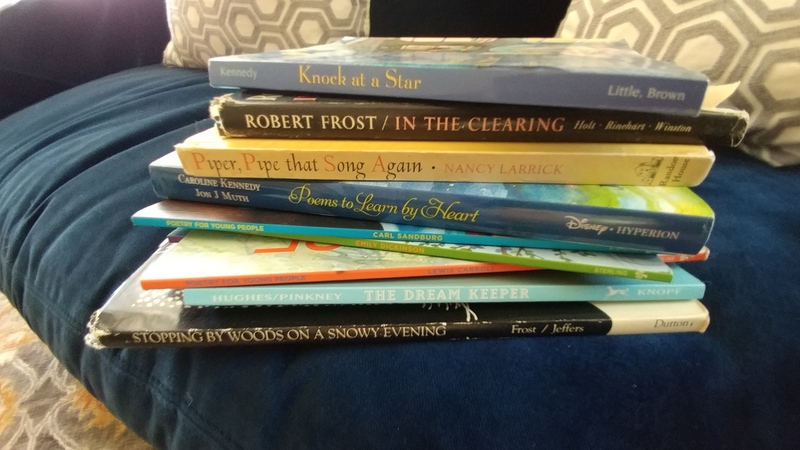 By the end of our first school year together, we had read hundreds of poems and we each had amassed a personal collection. We had found our point of entry into the wonderful world of poetry. Year two, I wanted to delve deeper into the subject. I decided we would take some great poems and re-write them, using existing meters. By borrowing templates, we felt immediate success in our writing. We also studied song lyrics by reading them as poems and sung poetry as songs. We read outloud and wrote in private. We studied Haikus and diamond-poems and acted out “Paul Revere’s Ride” by Longfellow, combining art with poetry at every chance. Teaching poetry to two young children, while learning myself, meant it had to be FUN. But who shall get them out? Years three and four we concentrated on free-verse, two-voice, epic and spoken word poetry. We continued to read, dissect and appreciate poets with unique styles and those who pushed open the envelopes of traditional writings. 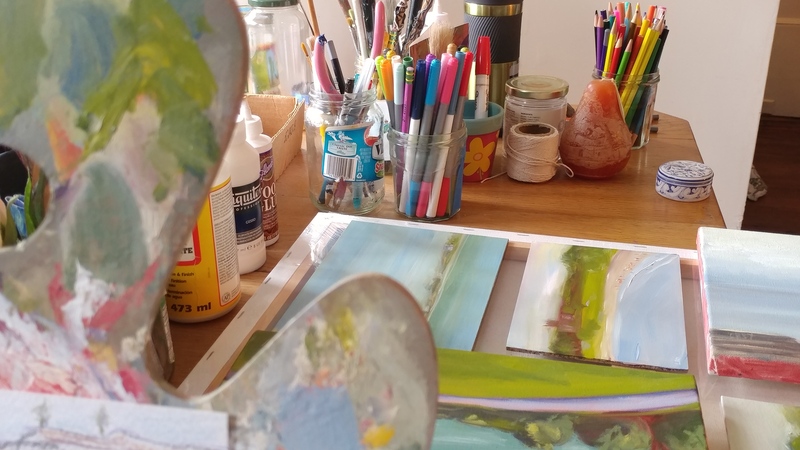 The kids’ original works began to flow with greater ease, as the once intimidating realm of poets had been cracked open to expose so many styles, so many forms of expression. We learned that writing traditional poetry meant obeying some rules and restrictions; yet once these rules were known, they allowed themselves to be broken. Through our studies, we earned our poetic licenses. 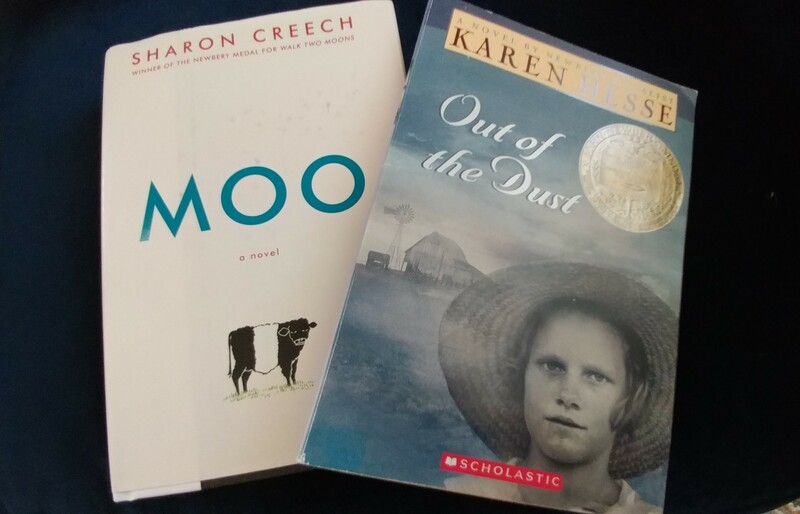 Reading novels written in free-verse poetry helped us to appreciate and understand the limitless genre of modern poets. I have never forgotten Angel’s comment about the reciprocality of honest communication. Because we wanted to learn this foreign language of poetry, it reciprocated in kind, and opened up a heartline for us. I love so many poets. I am in awe of the openness and vulnerability inherent in the poetic process. There is no hiding, no pretending. Poetry is word-play in naked truth as the reader sees, hears and understands however he/she wants. Small volumes or “chap books” are perfect for a porch read, a plane ride, or at night before bed. Guaranteed good dreams! 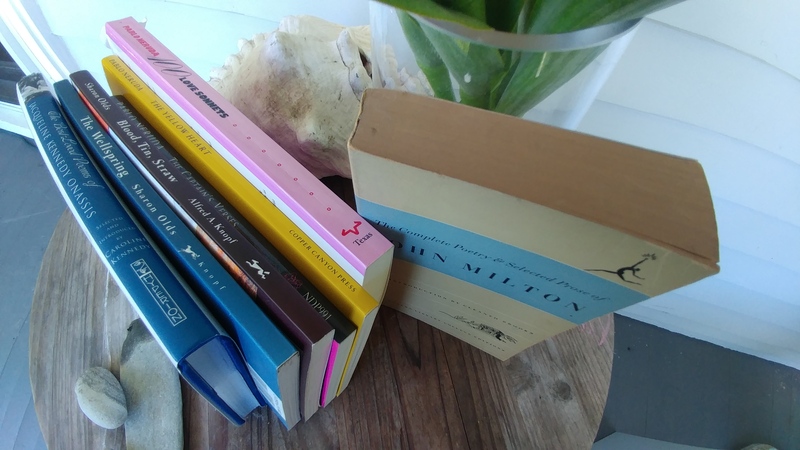 Poetry as therapy: During the past year, I experienced mild insomnia – anxiety that would inconveniently make itself known in the middle of the night. Instead of worrying about nonsense, I consciously worked to appreciate my many blessings. To further develop this practice, I began to write down my middle-of-the-night thoughts, and what transpired – due completely to our school studies – were stanzas. My writing resulted in renewed full nights’ sleep and piles of poetry I never intended to write. So, armed with abundant support and a wellspring of false bravado, I published my first booklet of original poetry. As always, I find myself learning, growing, evolving, right alongside my children. Did we find poetry, or has poetry has found us? Perhaps it is a mutual connection; a reciprocity which occurred because we wanted to understand. 1. E-mail me at reys@gotimbalero.com, and we can coordinate your order. 3. 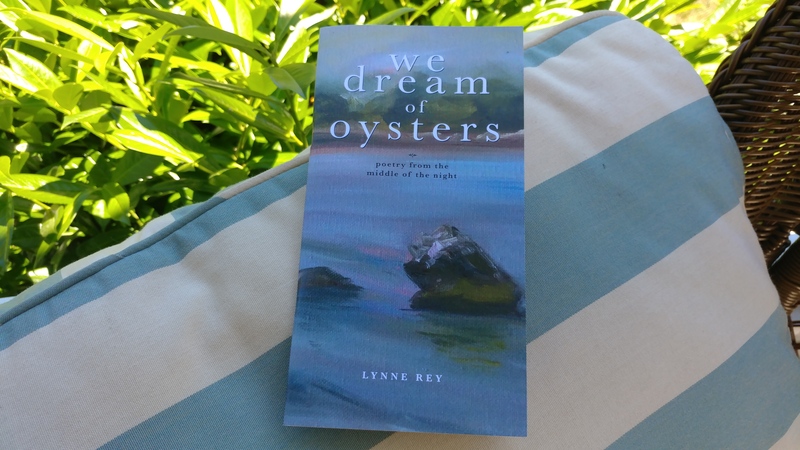 There is a PayPal link on the subsequent blog post titled “We Dream of Oysters”. I want one! You sound like a hard working teacher! Love this. Can’t wait to read it!